Guatemala was lashed with high winds and an unbelievable deluge when Tropical Storm Agatha struck this rugged Central American country in the spring of 2010. Despite the challenges of weather and due in large part to donations from generous Arbor Day Foundation members, conservation efforts in this Central American country were undeterred. 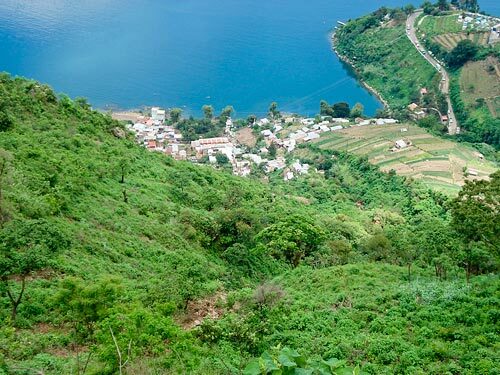 In fact, local partner Vivamos Mejor was able to announce planting the millionth tree in its valiant effort to stabilize the slopes around beautiful Lake Atitlan. Trees that have been planted or preserved on Guatemala’s steep slopes protect villages, crop lands and the waters of Lake Atitlan. A major Rain Forest Rescue emphasis during the past year has been to provide support to the people of Guatemala and their conservation efforts on the steep, volcanic slopes surrounding the precious waters of Lake Atitlan. Working in partnership with The Nature Conservancy and local organizations, the Arbor Day Foundation has helped establish and expand native tree nurseries, support conservation education efforts and fund scientific studies that contribute to understanding the hydrology that affects the country’s water supplies. When local partner Vivamos Mejor planted the millionth tree, the event illustrated what has been possible in the five years since that reforestation effort was initiated. 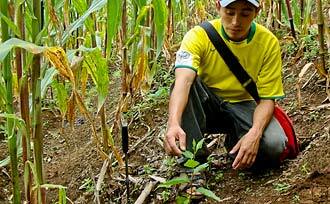 The project has been a model in involving community members in forest management and sustainable agriculture. It has helped stabilize hillsides with fast-growing native trees like pine (Pinus oocarpa), cypress (Cupressus lusitanica), alder (Alnus jorulensis) and two species of oak. Students and others have received hands-on training in nursery production, tree planting and sustainable forestry. To date, 20 municipalities and nearly 1,800 men and women have participated. Replacing cropland with forest production is often the best choice for economic, social and environmental stability. Guatemalans lost 156 people in the aftermath of Agatha and 500 schools and 300 bridges were destroyed or damaged. Nearly half a million residents faced property damage. Much of this was from mudslides that resulted from centuries of ill-advised logging and inappropriate agriculture. 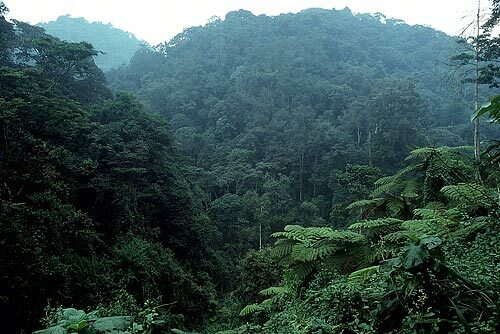 Rain Forest Rescue is protecting remnants of native forests and reforesting barren slopes or former cropland. 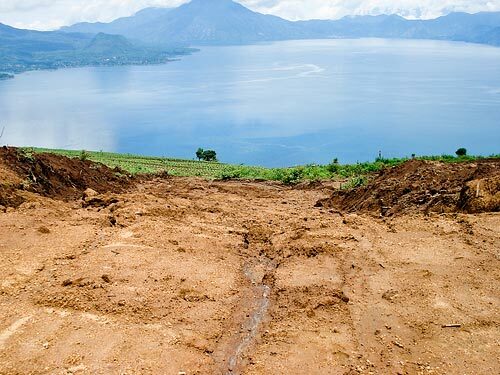 In a report following the big storm of 2010, The Nature Conservancy reported, “Areas that were reforested or where existing forest areas are being actively conserved seemed to be in relatively good condition in relation to other areas in the Lake Atitlan area.” Trees also mitigated damages by reducing mud and rock slides that did occur. 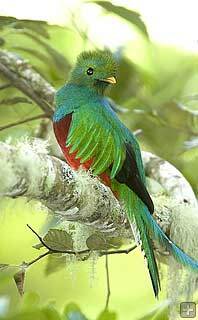 Rain Forest Rescue is making a difference, but the need for further action is great. 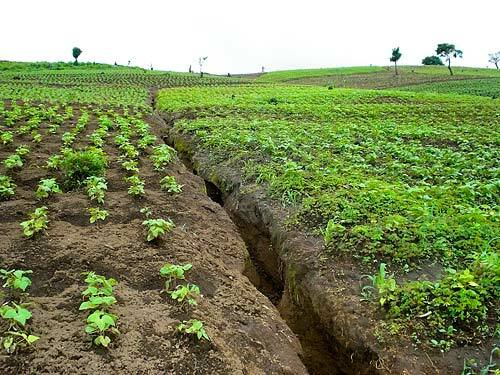 With support from Arbor Day Foundation members, progress will continue to be made in the effort to restore the vegetated mountain slopes of Guatemala and other tropical countries. Through partnership with The Nature Conservancy and local organizations and communities, the following initiatives were made possible last year with support from Rain Forest Rescue. A careful inventory was conducted to determine the most effective places to plant the next crop of nursery-grown seedlings. Local partner Vivamos Mejor identified additional sites and properties for tree planting. Emphasis was on areas affected by Tropical Storm Agatha in May 2010, as well as sites vulnerable to future landslides and heavy rainfall events. Reforestation of vulnerable lands began in June. 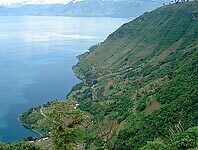 According to preliminary data, approximately 102,000 oaks, pines, alders and cypress trees were planted on 237 acres in the Lake Atitlan region. Fifty-three women and 151 men from the municipalities of Nahuala, San Antonio Palopo, San Juan La Laguna, San Lucas Toliman and Santa Lucìa Utatlàn participated. All landowners involved were trained in reforestation techniques and plant maintenance. Landowners who provide a portion of their properties for reforestation are provided with financial compensation to offset the loss of corn crops that otherwise would have been planted. Funding for these community members is also being sought from Guatemala’s National Forest Institute’s PINPEP program that promotes incentives for small forest landowners. 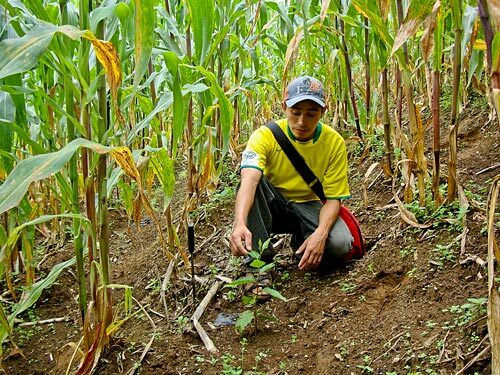 Through this program, participating landowners would receive annual payments per acre of land they have reforested, up to three years. This financial incentive would be welcomed by participating landowners, who despite being impoverished, generously provide their land to restore ecosystem services and protect communities from natural disasters. 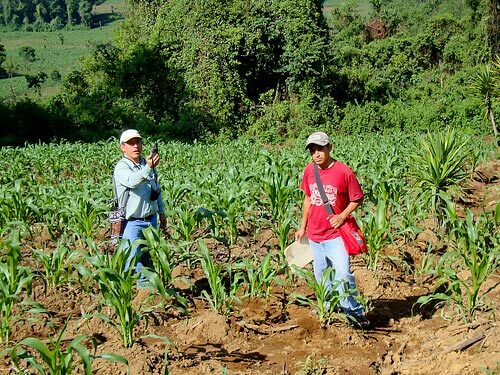 Two tree nurseries in the municipalities of Solola and Santiago continue to successfully operate and provided a majority of the trees for last year’s planting projects. A new tree nursery capable of producing 500,000 plants was established in the community of Santa Lucìa Utatlàn by an indigenous community cooperative known as the “Heart of the Forest.” This cooperative has registered their land as a community reserve and operates a hotel and restaurant to generate income. From the new location of this nursery, communities on the upper slopes of the Lake Atitlan region will be more accessible and effectively served by the reforestation project. 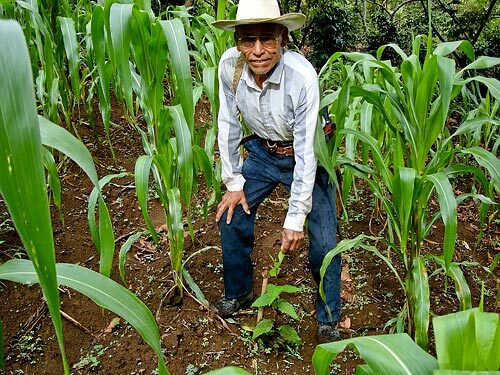 Two small tree nurseries established in the municipalities of Sumpango and Patzicia by local partner Sotzil are also productive, with 20,000 plants produced in the Sumpango nursery and 30,000 plants produced in the Patzicia nursery. These trees are both planted in the communities and sold to contribute to the economic sustainability of the nurseries. The Sumpango nursery is managed by a women’s co-operative and Sotzil plans to turn over management of the Patzicia nursery to a similar community group. Technical and scientific information continues to be gathered to fully understand the hydrology of the region and the key watersheds that support the metropolitan center of the country, Guatemala City. This information will help in identifying the key areas for investment and prioritizing future actions. Informational materials are being produced to inform the public and all stakeholders about the importance of protecting the city’s watersheds and recharge zones. In addition, discussions continue in an effort to form coalitions to study and protect the nation’s waterways. Mudslides on deforested land and steep farm land. The devastation took lives, produced massive property damage and threatened the region’s water supplies. Slopes stabilized by native forests or tree plantations suffered less damage and bode well for the future. Conversion from row crops to tree cover on selected parcels of land will protect communities and water supplies. 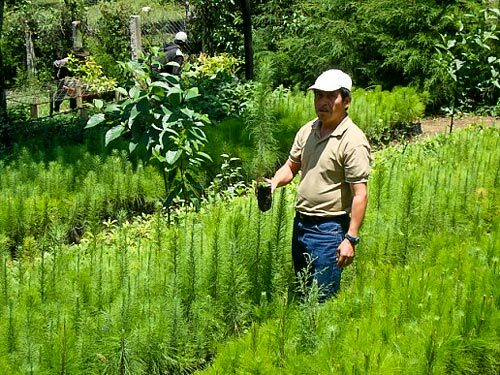 Locally-operated tree nurseries are an essential component of reforestation efforts. 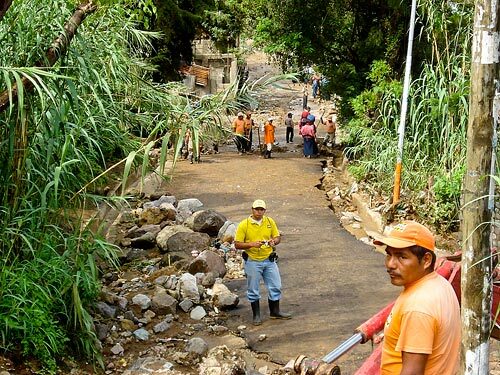 Preventing future flood damage and devastation from landslides requires the cooperation of all stakeholders and financial support from Rain Forest Rescue. There are two schools of thought about protecting rain forests. The rain forests of South America. One is to create preserves (“protected areas”) where no human occupation is allowed, and visits can only be for scientific study or passive recreation such as wildlife viewing. The other approach is to maintain forest cover through community control of forests that are managed for sustainable production of various commodities. Although recognizing that both kinds of protective policies have their place depending on circumstances, the Arbor Day Foundation has primarily supported the latter method for many years. For example, Arbor Day shade-grown coffee helps promote farming practices that retain forest cover and wildlife habitat and reduce the need for chemical inputs. Also, Rain Forest Rescue promotes community education that can lead to local rules for managing the forest sustainably and for multiple purposes. The report is based on the authors’ examination of peer-reviewed studies of 40 protected areas and 33 community-managed forests in 16 Latin American countries, two countries in Africa and three in Asia. They then compared deforestation in these areas. They found that while the protected areas lost an average of 1.46 percent of their forest cover per year, community-managed forests lost only .24 percent per year. An important reason for the latter is that despite development pressures, communities that have working rules for managing forest areas are in a better position to protect the resources.